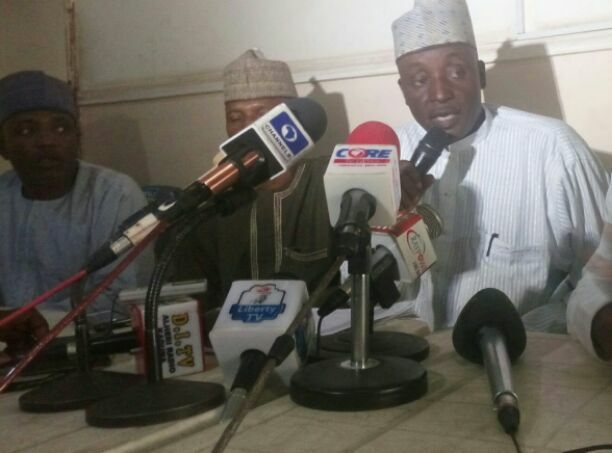 Addressing journalists at the Secretariat of Nigeria Union of Journalists (NUJ), Kaduna Council over the weekend, Assistant National Secretary, Miyetti Allah Cattle Breeders Association of Nigeria (MACBAN), Dr Ibrahim Abdullahi who was flanked by the State Chairman of the association, Haruna Usman said, the time has come for all the warring parries to shield their swords and embrace peaceful reconciliation for the troubled areas to regain its lost peace. On effort made by the state government to address the incessant herdsmen attack on Southern Kaduna which he said has foreign undertone, he said, ” through our last visit to Niger Republic, we sat down with the nomads there and said please let us sign an agreement that when you are coming to Nigeria – Kaduna state, don’t come with arms, our government will protect you. ”That’s why this year, all these northern local government areas we have not had any incident of encroachment into the farmlands. It is important to add there several people of Sanga, Jema’a, Laura and Sango Kataf killed several Fulani they came in contact with and even their cows but were not mostly reported in the media, so people don’t hear that. But what is important to us now is peace across board”, he added. He further argued that, “it is not true our people relocated whenever there is planned attack. But they do so whenever their lives are threatened in order to protect themselves. “A typical example is one of the Fulani people, Miyetti, recently killed there. Miyetti has risen in political career even up to being a supervisory councilor in the local government council. Recently Miyetti was in Kaura and he was arrested taken to the police, and retrieved from the police, killed and set ablaze. So what we’re trying to say is that we want to be saved ourselves before we give our contributions. Some of us are contributing because we are here in Kaduna. “I’m contributing because there is no problem where I come from, there is no problem we are living in peace there. So nothing will happen to me in Jaba; but like him who’s from Ja’ama and Kaura, he dare not go to those areas. “So, what I’m appealing is that let us proffer lasting solution to this challenge. Any Fulani man migrated and then return to any part of southern kaduna let us know him, meet and ask him why. I’m more worried than you because I’m a Fulani man from the bush. A Jaba man came to take me to his house, and educate me by sending me to primary school and Islamic school, and here I am today. I’m worried because I see Jaba as my second home, see the people as my brothers”, he stressed.